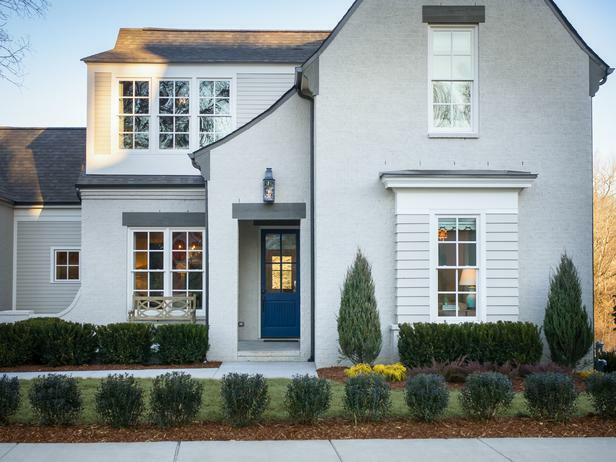 The HGTV Smart Home 2014 is described as “an English country home” in Nashville, Tennessee. Fancy futuristic tech wizardry in houses doesn’t excite me much, I’ve gotta admit, although it’s interesting to see the things they come up with. I’m always more interested in how designer Linda Woodrum decorates them. A few things about the house surprised me, starting with the red dining room. We don’t see many painted dark red like this any more. Are they staging a comeback? They seem to have scattered books and papers around the dining room to show that it can serve double duty as a home office (according to the video tour). Not sure I could get much work done in a red room, though. From this angle you can see that there are barn doors that can close the room off from the foyer, which would come in handy if you used it as a home office. Another thing that surprised me: the master bedroom is right inside the front door, off the entry hall. I’m not sure I’d want visitors to see my bedroom right off the bat when they walked in. I’d have to remember to keep the door closed (ha). Not only that, but they used a dark brown color in the master suite (Sherwin-Williams Foothills 7514). Another color we don’t see as much of as we used to since gray tones took over. I’m loving all the blue and white in general that started with the front door. They used Indigo Batik SW 7602 as a signature color that we see again in the kitchen and adjoining family room. Do you watch The Little Couple on TLC? This family room reminded me of theirs. Different colors but a similar layout. I had to go look up a picture of it to compare them (you can see my post about their house here). One more thing that I didn’t expect to see in the house: a stage set up in the lower level. Kind of a fun nod to the fact that the house is in Nashville. What do think about this year’s Smart Home? Wanna win it? 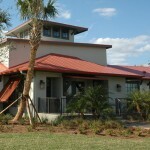 Visit HGTV for more photos and information about entering the contest. Beth got a personal tour of the house and wrote a fun post about it on her blog Unskinny Boppy, too. Hey, thanks for the link love, Susan! Hope things are great with you! 🙂 It was a beautiful home, but I agree- surprised at a lot of the choices they made. Why did I just call you Susan when I know your name is Julia? LOL!! SO sorry sweet lady! Awww, I’m sorry, didn’t anybody tell you? I’m going to win. But you can come visit! Darnit! Well, as long as I can visit. Ha. Hardly watch HGTV any more, so had missed this. Thanks for the info. I love the Tudor style and the practical layout, and it’s not too big. They had me at the front elevation with the English elements like the steep gable, the ‘cat slide’ roof over the door, the painted brick and blue door (like my own house), and the broken up facade of the garage, so it’s not one big expanse. I like the master on the main floor and there is a bit of a corner to walk around so the door doesn’t open directly from the hall. Didn’t care for the red color of the dining/office – that was so overdone in the 90’s, but loved the blue kitchen cabinets. The kitchen was relatively small, but I liked the layout – for those who want an open kitchen! Love the butler’s pantry and mudroom/laundry room. Pretty much love everything. But I’d have to sacrifice some TV’s for book cases! Since all my family except me are musicians, the basement would be perfect! Not sure about all the gadgetry – what happens when the computer crashes? Or I’d go to use my phone and raise and lower the blinds or something. To clarify, I’m not in love with all the decorating choices (though blue and white is my favorite), but love the house itself. I could change some paint and decor. Red is considered a very productive color. I still have a red dining room and living room and can’t bring myself to change it yet. Don’t care for all the greys and brown being used now, looks cold and up inviting. I don’t think I can handle that much visual stimulation when I’m working. I get distracted too easily! Ha. Agree on the red dining room and brown bedroom–do not care for it. The kitchen island looks too small, and certainly too short for those stools–whose thighs would fit underneath? I would love to see something someone other than Linda Woodrum designed. She does a lovely job, but come one, time for someone else. Yeah, I agree, it would be fun to see what another designer might do with these houses. Absolutely time for a different designer. Good point about the barn doors. I would have preferred them in white, too, just to break up some of the red in the room. I would love to win it but some major redecorating would be happening. Loathe the brown in the master. Not lovin’ the red dining room/office. Not in love with that shade of blue in the kitchen etc. Yeah, really don’t like the decor but, hey, if I won it I wouldn’t be complaining! I have to say that I am not in love with Linda Woodrum as a decorator. Her style is kind of looking a bit dated to me. I love the smart home and hope and pray to win it for me and my family so we can be safe. I’m sure my husband and sons would want to know if the guitars, amps, mike, and keyboard came with it. I no longer watch HGTV either so thanks for sharing this! I think I am a snob because if you tell me you are showing me an English Country Home, I want the gardens that go with that. Oops! I really love the Butler’s Pantry palette and layout. The colors of the kitchen and dining room work for me, but I agree, the stools looks off. The rec room and stage are a lot of fun. What drives me batty are the TV’s everywhere. I don’t like them in bedrooms or kitchens so if I won, looks like a few would have to go. While I like the attention to detail for pets, what if you don’t want a dog or like me, have a handicapped one? One thing that kind of freaked me out was all the security system stuff. I understand it is a techie smart home, but it just screamed “You will be burgled here” to me. Good point about the gardens. I hope whoever ends up living here plants some to go with the English Country exterior! And I laughed when you said it all screams “You’ll be burgled here.” Hadn’t thought of it that way, Fiamma! Ha. I didn’t think there was a color I loved more than SW Sea Salt but Indigo Batik might be a close runner-up! I love all the blue and white paired with a pop of green. I have never been a fan of red dining rooms but I agree if the barn doors would have been painted white the red wouldn’t have seemed so intense. As far as the master bedroom being right off the foyer, we have the same situation in our cape cod and while its not the most ideal location, it beats not having a 1st floor bedroom. Downstairs master’s are in high demand in our region and a “must-have” among the aging baby boomers. I’m loving the Indigo Batik blue, too. Wish I could find a room in my house to try it! The island in the kitchen is made from reclaimed lumber and fitted with electrical outlets in each corner. So there are plenty of places on that island to plug in that toaster. Likes: blue and white kitchen and family room, interesting exterior, music room basement, blue paneled upstairs den. Dislikes: brown bedroom with the too-modern large graphic print, over-island light fixture (I’m seeing these lightbulbs-in-a-huge-metal-open-frame thingies everywhere – yuck! ), kitchen island chairs and stools, and boring white hallway. Overall it’s better than most HGTV houses. I don’t mind the red dining room so much with all of the doorways and windows breaking up the color. Just looked at some of the video tour, and I agree with other posters – this house has WAY too many TVs. Good grief! Heaven forbid you don’t have a television in your direct line of sight! We need TVs in our dining rooms and showers now??? Ick. They want to make sure you’re watching HGTV in as many rooms as possible, I guess! Ha. SO. How could I not love this house — as we, too, have a navy (I mean “indigo”) couch!? Besides that happiness, I also super love how the 2-car garage looks “added on to”, which ups the curb appeal in my world. Meanwhile, take a look at the area rugs — they’re ginormous. Makes a gal think that wall-to-wall carpet’s on its way back. Speaking of comebacks, I think brown’s the next “it” color. IKEA has lots of brown couches in their stores, + they must know something. One more thing: check out all the evergreens in the landscaping. I have an indigo couch, too! It’s very functional in a house full of boys. We love it! Maryrose, ours is functional, too — because we have 2 black dogs + 1 black cat! Yikes! I yearn for white slipcovers but no can do! I agree, Kay — I like how they designed the exterior with the garage off to the side. Interesting to hear IKEA is stocking brown couches (haven’t been there in a while so didn’t know that). And good point about the HUGE area rugs that cover so much of the hardwoods that they have a wall-to-wall carpet feel. I was especially surprised to see that in the dining room. I hate the fireplace. Like most everything else. Love the front door. Love the kitchen but would want a farm sink. What don’t you like about the fireplace? You made me go back and look at it again in case I missed something. It is a bit of a white-wash. A wood mantel might have been nice. And I agree about the farm sink, especially since this is their take on English Country style. I love the house just the way it is, wouldn’t change a thing. I especially love the dark bedroom. I love the color theme. My personal favorite thing is, the remote toilet. I live in Smithville tn., so it wouldn’t be too far to move. love it!!!!!! I absolutely love every part of it! Gorgeous! Yes! Whoever wins will be expected to invite us all over, and we’ll have to have a jam session in the basement! My husband would love that basement stage. I’m not smart enough to live in a smart home! I don’t even want a smart phone. I have been entering the contest every day. If I am ever lucky enough to win one of these beautiful HGTV houses…I will take the cash option so I can pay off my current home, retire and travel with some of that money! We have a downstairs master that has an entry door right off the foyer, within view of the front door. If the door to our bedroom is open, you can see our bed through the glass in the front door. Let me tell you, that door STAYS closed ALL the time. This was a huge drawback to the house when we looked at it, but all the other qualities of the house kept it from being a deal breaker. Now that we live here, it’s really not a problem. I love that color blue, but not on the kitchen cabinets. I think that the bright colors on kitchen cabinets is a trend that will soon look outdated. Love it on the front door and in the family room, though. I don’t mind the brown bedroom, although I would have chosen differently. I have a friend with a first-floor master who said she feels like she has to keep it clean all the time because it’s right off the family room. I’d love the convenience of not having to climb the stairs to get to it, though! Like the house , but I couldnt take that much red in one room. I love little bits of red here and there but that room is way too much for me! Thanks for the post! Right at the curb, I’d be wondering, “Why did they use a shed dormer for the 2nd garage bay?” It’s so incongruous with the sort of updated English cottage style of the rest of the house. I actually love the red. In my last house, my dining room was red. I think it really works in this house. I do love the blue too. I usually don’t like that shade, but this one I do! It’s always hard to match accessories with blue, but for some reason, I don’t think this shade would be as difficult. Yeah, master off the front door? I guess if you usually enter the house from somewhere else, that might work. I would keep it really clean too! I like the exterior of the house. In fact, this is one of the few HGTV homes that caught my attention. I would definitely add the English gardens. It needs to be better landscaped with a flowing fountain out front. Even though the home is in Nashville, country ain’t for me. I love a home that eludes elegance and glamour. I do not like the red color in the office. I do not like the color of the wooden floors. I love wooden herringbone floors in a darker shade, maybe a reddish brown with a hint of ebony stain. I would rather see French doors instead of ugly barn doors. The blue color on the walls is too vivid for my taste. A lovely pale lavender suits me better. I would replace all of the lights with more Crystal chandeliers. I would keep the chocolate brown master but not in the front. I would not have that bedroom in the front away from my kids bedroom. I would add a fur throw and a chaise lounge in the master. I would have to have a larger house. More space in the rooms. I would have built in a sweeping staircase and enlarged the hallways. They are too small. I would have added built in classical French molding and bookcases. Too many TV’s. Oh, I loved the first picture, and thought “How lovely to incorporate smart technology into a traditional style.” Then I saw the second picture. What were they thinking with that goofy garage? The lines just totally ruin the look of the house. It’s like someone bought a spare garage somewhere else and stuck it on the end! I’m with Julia on the upstairs blue den – really cozy. The master bedroom made my head hurt. OK when are you moving in? Hi Julia it’s a beautiful house but like you I did question some of the colour choices, and some rooms look a bit over furnished for me,…it’s that dusting thing. My son would love the stage room, it would get all his guitars out of the lounge room and the drum set he insisted that he could not live without and hasn’t touched for a very long time (parents do get sucked in sometimes). I love the outside of this house too. Thank you for sharing this lovely. Till next time Regards Esther from Sydney. I keep looking at this house and watching the videos – I’m that taken with it. But the more I think about it, I don’t believe I’d want my casual dining table the same as my work island. The island will get used a lot for food prepping. I know there are lots of houses with an island + eating bar but they usually have a table as well. And I don’t see going into the dining room every day for casual eating (even though they put a TV in there – horrors!). Not sure how I’d handle it: smaller island plus a dining table instead of a sofa table; part counter height island with half a lower level dining surface? I think the English Country ideal would have been a big farm table, but the island isn’t quite the same. Anybody have something similar that they love/hate? I hadn’t even thought about the fact that you’d have to eat in the dining room-slash-home office or at the island. And the island only has seating for 2-3 people. That doesn’t seem very practical, does it? Too bad there wasn’t room to fit a kitchen table somewhere. Linda must not have been feeling well, or had a small budget. Her houses are always overstuffed full of furniture and way too many accessories however this one seems somewhat empty and without flow. As houses go this one seems more approachable than the regular yearly dream home. Wall paint is easy to change so I’ll be real busy once I win! Love the outside of this home. Good point about the acoustics! This is the first HGTV Dream Home I actually think is really beautiful! I love the English Tudor style, and the home doesn’t seem ginormous. In the video tour it seems cozy. Though none of the colors, except the red dining room-love it, are ones I would have picked, everything works in this house. I love old houses and this one reminds me of what the historic houses would have looked like when they were brand spankin new. The crown molding, framed doorways and windows, hardwood floors, that amazing wood paneling in the upstairs blue den, all of it is so beautiful. (That blue den is by far my favorite room!). I’m not crazy about a downstairs master bedroom, but this one is so pretty, I could get used to it. Or make it a guest suite. My Mom would love that! I wish we could see the street view and see what the neighborhood looks like. Nashville is supposed to be a great place to live. My family is from Knoxville, and we love the milder weather and Southern Charm of the South. Whoever wins this house will get a really beautiful prize!! What I like most about this home more than other HGTV is it’s size. I am guessing 2,500sq ft.? My sister’s home is 7,000 sq ft with 10 foot ceilings and 3,000 feet of basement – it makes me cringe – the carbon foot print of that house (of a family of four). I live in a home 1,500 sq ft which is fine – but 2,500 I could do. I think any new construction has a walk out basement? (which I like the light they add, but also like having a patio vs deck of ground floor) All that dirt they removed around the basement sure would capture a lot of rain to ward off flooding basement though. Think the only part they dug out was under the garage? Would be nice to see what the back looks like. Also like that this is not a garage-mahol! I love this house and I love the floors! However, 2013’s house was very beautiful too. Unfortunately I cannot win any house, since I live in Italy. But feel free to invite me over if you win! I lived in Nashville in the early 2000’s and EVERYONE had a red dining room and the color blue was nowhere to be found. What a difference a decade makes!!! The bad outweighs the good for me on this one. I’m not at all impressed with the outside of the home. The red dining room….yikes. I would change the wall color and make it a more casual space, especially since I wouldn’t be eating meals at the kitchen island every day. Speaking of, those bar stools are ridiculous. I’m so tired of decorators trying to cram in every trend in model homes. Just make it look nice – not like every page of every decorating magazine on the shelf. Where has the individuality gone?! With that being said, I actually love the blue cabinets, and that the island is a table instead of a big bulky piece of furniture. I’ll have a LOT of redecorating to do when I move in…! You are right on about some of those choices. The red dining room is not what we are seeing anymore, and the reflected light off red makes food look so creepy. And the poo brown bedroom… um no thank you. Too editorial and in the wrong direction. The blue den is fabulous but if one must have a white ceiling it has to flow down at least one wall or your eye just gravitates up which bounces and makes the inhabitants uncomfortable – or paint it blue. LisaK was right on the mark pointing out the fatal flaw in the kitchen, those stools do not fit with the island to accommodate a person. And lets face it, six people are not going to sit around such a dinky kitchen island, especially on backless bar stools. Starting with the first photo, the outside architecture is weird – not having appropriate sized eaves makes the house look like someone cheaped out. We inherited the color (I think it’s Behr’s Hot Pepper or similar name). It’s definitely strong color, and our realtor recommended we paint it if we ever move, but we’ve grown to really like it. It gives a very library/Harvard club/gentleman’s study feel to the room. I think I could live with it in a really formal dining room, but it’s not the most casual color so I don’t think it would work for us in that room. I really like the house, all except the expanse of concrete and the double garage in the front. I realize that has more to do with the lot size than design, but it’s still unfortunate. The colors downstairs come across to me as a loose interpretation of patriotism, and while I am not usually on board with that type of decor I think it is subtle enough here to work. The blue kitchen is wonderful— and I don’t really even like blue, so perhaps that is my reaction to the uber neutral kitchens of the last few decades (including my own). The upstairs den is my favorite as well– very clever design. All in all, a far more interesting house than many of their previous ones. Just amazing how many different styles there are in the world. I would not choose this house for my family: it’s either feast (too much color and stuff) or famine (too stark) in this house. No flow from room to room or just no breathing space to spread out. (First thing I’d do is take down that massive TV!) So, this house will just have to be won by somebody else!!! And they will love it, I’m sure! I have a red dining room and I love it! That being said, this house overall doesn’t “do it” for me. I actually really like this. I like the pops of bold color. Not sure about the placement of the master bedroom, but other than that, I think it’s really fresh looking. There are a slew of good designers out there and yet, HGTV continues to pick Linda Woodrum for 99.99% of their homes. Her designs are getting old and dated [including that red dining room!]. The bar stools are too high and interfer with sight lines; there is too much furniture to walk around to get through the rooms; and way too many TVs everywhere. It looks like the kitchen island has electrical outlets on the back side. I just had to check when someone asked why the toaster was on the island. Thanks for solving that mystery for us, Genevieve! I don’t like the dark colors. The exterior of the house is nice tho. What a beautiful home with beautiful red curtains, which gives a gorgeous touch. Your master bedroom is very beautiful, I loved all the blue, and white color that started with the front door. Just amazing . Unfortunately, the house looks as if it’s sitting on, or next to a flood plain. It floods a lot in Nashville. Pros: Ground floor master, Lots of Tvs, Kitchen cabinets to the ceiling and painted blue (it’s nice to see colored cabinets for a change), Blue color scheme overall, Basement w high ceilings with rec room with projection TV, Stage area could be versatile for other uses/interests, Exercise room, Bathrooms are all attractive except basement (not a fan of mustard stripes – but easy to change), Versatile Dining room ( like the red – love the office concept), Mud room & laundry have great storage, Butler’s Pantry is full of more storage & has wine refrigerator, Upstairs kids bedroom could be a 2nd master bedroom, Guest room with curtained TV is a good option for a guest who doesn’t want a TV in the bedroom, covered outdoor space with seating, spacious Living room for entertaining with cool/practical motorized curtains. Cons: Entry just a long hallway, sound issues with open plan and all the TVs/sound equipment, TV room upstairs with no door -can’t contain noise, mustard bath and stripes in exercise room, need bench in mudroom, need more landscaping and back yard feature, master in brown is attractively done -but brown not my cup of tea, only kitchen island to eat at for casual dining, mustard stripes in kids room. What I would change to personalize the house: I would pump up entry by having a photo gallery with directed lighting to grab attention, Add a soundproof door at top of basement stairs to contain sound, paint barn slider doors white, change master bedroom to navy/white (same everything else), Add bookshelves to MBR on wall with painting, add an icemaker and bar sink to pantry, add overhead glass doored cupboards for bar ware to pantry, wouldn’t touch the kitchen, would change the sofa table in the Living room to a table which folds open to dine, TV wall in LR would become a wall of bookshelves with the TV in the middle, install a runner on the stairs for safety &soundproofing, Take out one of the “pantry” cabinets in the mudroom and install a bench with hooks & cubbies above. Basement: change the mustard bathroom & exercise room stripes to persimmon/orange (like it with grey better than mustard)- same for pillows etc..Persimmon would be my accent color, add bookshelves to projection TV wall with pulldown screen in front. Upstairs: put a door on the upstairs TV/sitting room so TV doesn’t disturb sleepers, add some wallpaper or art to blank guest bath wall, colored towels for both baths, change out mustard stripes to pale blue or Persimmon in kids room. So…the only major changes are painted stripes, bookshelves, two doors, a bench in mudroom; the rest would be personalizing the house to the needs of my family. I can’t walk into any house without thinking what I would do to it…. However, if I win, I would sell the house because I love my own house and I love living in Coastal, NC. I may have missed it but I’ve been trying to find out what the rear of the home looks like – is there a deck, yard space, landscaping, etc. Does anyone have an answer? Thanks! I remember seeing photos of the back of the house on the Smart Home section of HGTV.com. Check there! My family loves this home! Obviously no one leaving replies has ever been poor! If we were to win this home it would be a DREAM come true. We live in Illinois and stayed to take care of my mom. She passed on 2 years ago so now we take care of my mother-in-law. She is willing to go anywhere we want to go. We have talked about moving to Tennessee because my dad is there and needs me there. However we can’t afford the move, but I we won the smart home it could happen and then I would be able to care for my dad and mother-in-law. Life would be so simple. I look at the pics and videos of the house and dream about how much fun it would be to live in it. But then my husband reminds me that only rich people win these things. He is right, have you ever seen them pull up in a trailor park, to an old trailor and telling the family “you just won the home of your dreams”, win the lottery, or publishers clearing house? It has been fun dreaming of living in such a nice home with my husband, 3 children, and mother-in-law, only a 45 minute drive to my dads. I know whoever wins this home will be the luckiest family in Nashville. To the winning family… I hope all your dreams come true and god bless you! Hope I win the house. I would have to make a bunch of changes since i think that the house is too small. It may be in English Tudor style but it still looks odd and cut up to me. I would: cover the top porch and screen it in. Glass-in and heat the lower porch. Build a a small cubby up in the peaked portion of the Garage-pit a desk, bookshelf and a roll-out window so i could smoke my pipe up there. look into converting the garage into a larger master suite and building a new garage in front of the current one. I am convinced that this home doesn’t even exist. Try and google an address for it. Of course the fact that google has become so greedy with ad words that you can rarely get what you are searching for. Does anyone know what the address is? Other than Nashville (pretty broad area there) I can’t find anything about it. Since I have already bashed google, I might as well go ahead and bash journalism in America. The single most important item on this topic is not found in a single article. Journalism has become less factual and informative. When I checked Google maps/streetview, the images were several years old, so nothing this new showed up, unfortunately. Where can I get the bedroom rug and drapes? I’m recreating the room. Need them NOW…..
Head over to HGTV.com to see if they give that info. I don’t know where they bought them. This house makes my heart jump a beat! I really love this house. Just recently went to Nashville for CMA awards. National is a beautiful place. I would love to live in that area. I wanted the smart home in Nashville in the worst way, but being the 21st of July, I think it’s too late for me. I dreamt about this house, and prayed all day long everyday that it would be mine. I want to move to that area for several reasons, one being for ancestry. It’s in the middle of my research area, my ancestors were from Oklahoma, Virginia, N Carolina, Texas, as well as Tennessee. Maybe I”ll stay where it rains almost everyday. Booo.